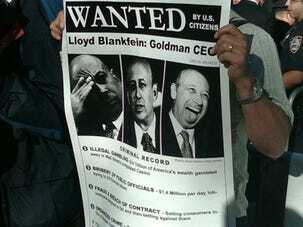 Categorized | concealment, conspiracy, corruption, goldman sachs, S.E.C. Is the most in-fraudential firm finally going down? Goldman’s latest 10-Q is out, and as Bloomberg first noted, the firm is expecting more CDO-related litigation and investigations. We anticipate that additional putative shareholder derivative actions and other litigation may be filed, and regulatory and other investigations and actions commenced, against us with respect to offerings of CDOs. The full passage is below. On April 16, 2010, the SEC brought an action (SEC Action) under the U.S. federal securities laws in the U.S. District Court for the Southern District of New York against GS&Co. and one of its employees in connection with a CDO offering made in early 2007 (2007 CDO Transaction), alleging that the defendants made materially false and misleading statements to investors and seeking, among other things, unspecified monetary penalties. Notices of investigation subsequently have been received by GS&Co. from FINRA and by GSI from the U.K. Financial Services Authority, and Group Inc. and certain of its affiliates have received requests for information from other regulators regarding CDO offerings, including the 2007 CDO Transaction, and related matters. Since April 22, 2010, a number of putative shareholder derivative actions have been filed in New York Supreme Court, New York County, and the United States District Court for the Southern District of New York against Group Inc., the Board and certain officers and employees of Group Inc. and its affiliates in connection with CDO offerings made between 2004 and 2007, including the 2007 CDO Transaction. These derivative complaints generally include allegations of breach of fiduciary duty, corporate waste, abuse of control, mismanagement, unjust enrichment, misappropriation of information and insider trading, and challenge the accuracy and adequacy of Group Inc.’s disclosure. These derivative complaints seek, among other things, declaratory relief, unspecified compensatory damages, restitution and certain corporate governance reforms. In addition, plaintiffs in the Delaware Court of Chancery actions described in the “Compensation-Related Litigation” section above have amended their complaint to assert, among other things, allegations similar to those in the derivative claims referred to above. Since April 23, 2010, the Board has received letters from shareholders demanding that the Board take action to address alleged misconduct by GS&Co., the Board and certain officers and employees of Group Inc. and its affiliates. The demands generally allege misconduct in connection with the 2007 CDO Transaction, the alleged failure by Group Inc. to adequately disclose the SEC investigation that led to the SEC Action, and Group Inc.’s 2009 compensation practices. The demands include a letter from a Group Inc. shareholder, which previously made a demand that the Board investigate and take action in connection with auction products matters, and has now expanded its demand to address the foregoing matters. In addition, beginning April 26, 2010, a number of purported securities law class actions have been filed in the United States District Court for the Southern District of New York challenging the adequacy of Group Inc.’s public disclosure of, among other things, the firm’s activities in the CDO market and the SEC investigation that led to the SEC Action. The purported class action complaints, which name as defendants Group Inc. and certain officers and employees of Group Inc. and its affiliates, generally allege violations of Sections 10(b) and 20(a) of the Exchange Act and seek unspecified damages.